The Coastal Bend Bays & Estuaries Program welcomes the opportunity to develop corporate partnerships, which help us reach a variety of audiences with important environmental and conservation messages, while raising funds to support our vital efforts to protect, research, and restore the bays and estuaries of the Texas Coastal Bend. 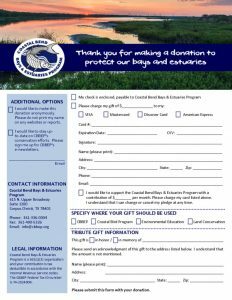 We invite your company to take part in our great programs and be recognized as a leader in educating and promoting the preservation of Coastal Bend bays and estuaries and all the tremendous environmental and economic benefits they provide! To discuss becoming a partner with CBBEP, contact Kiersten Stanzel, Director of Partnerships at 361-336-0315 or kstanzel@cbbep.org.